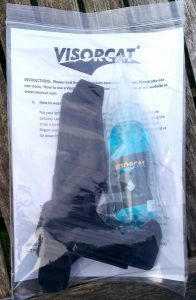 The Visorcat arrived in a simple clear bag, with a laminated instruction sheet and a 50ml bottle of cleaning fluid. The device is made from sturdy rubber with a nylon strap to go around your wrist and mini elastic loop to go round your thumb. It features a small cleaning fluid reservoir on the back of your hand and then along your thumb a flip back squeegee with a sponge underneath. 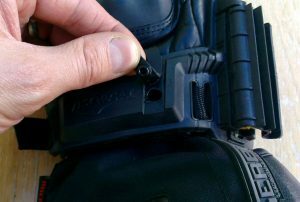 Fitting it is simply a case of sliding you glove through, lining it up and pulling the strap tight. 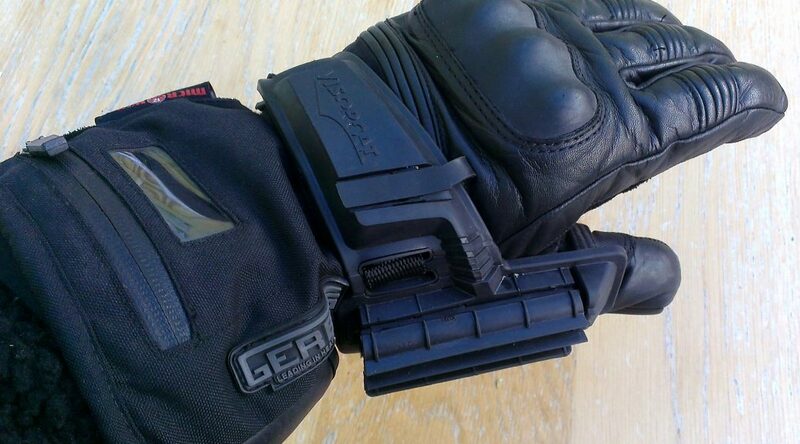 Dead easy, and quick to swap between different gloves. To use, one just wipes left to right first which flips back the squeegee and wipes your visor with the moist cleaning sponger underneath. Then wipe right to left to wipe the cleaning suds away with the squeegee. As the sponge dries out, you can just give the reservoir a quick press to squirt some more fluid through to moisten the sponge again. Filing up again is simple via a little flip open flap and poking the bottle of fluid in. Out on the road, the Visorcat works pretty well. The moist soapy sponge does a good job of cleaning crud and bugs off your visor with a couple of wipes. Definitely a novelty to do whilst on the move. However, it’s not perfect, it can be tricky to get a good clean wipe across your visor and often you need to wipe a several times to get a fully clear visor. This is partly because the squeegee is quite rigid and doesn’t seem to mould nicely to the shape of visor. It’s fine if you angle your hand just right, but otherwise parts will be left missed. Additionally, the Visorcat is a bit chunky and doesn’t comfortable sit far enough around your thumb to suit a natural wipe. When trying to arrange it better it tends to foul the switchgear. Hence you have to get the hang of wiping with the back of your hand rather than edge of thumb which feels more natural. It’s still way less faff than having to pull over and dig cleaning stuff out from under seat. With persistence I did get better hang of it to achieve more effectively cleaning. 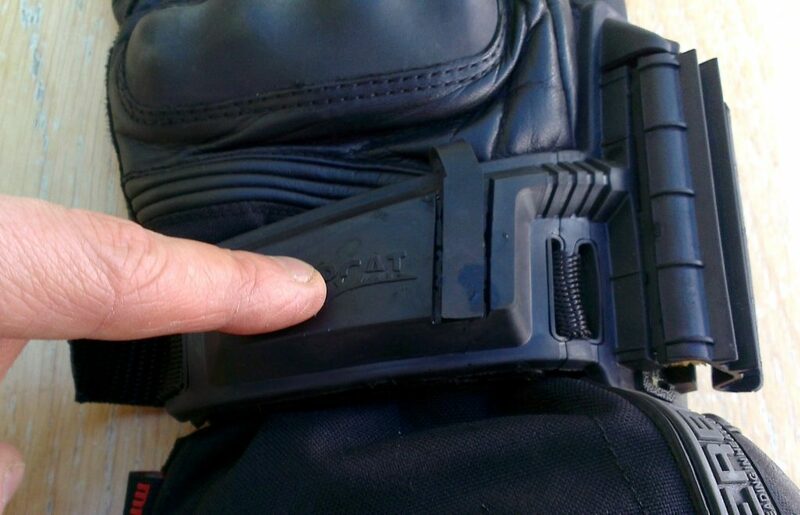 Maybe I was too used to the slim rubber visor squeegee down the thumb edge built into my gloves – your mileage may vary. My wife also attempted to try the Visorcat, but she has tiny hands and it was just too big for her and it kept whacking the horn button on her switch gear! Maybe there’s a call for a mini version for those with dinky hands. Fluid wise the reservoir holds plenty for a long days ride. When commuting in the week, the bigger issue was the sponge drying out between rides. Soon remedied by a splash of water. 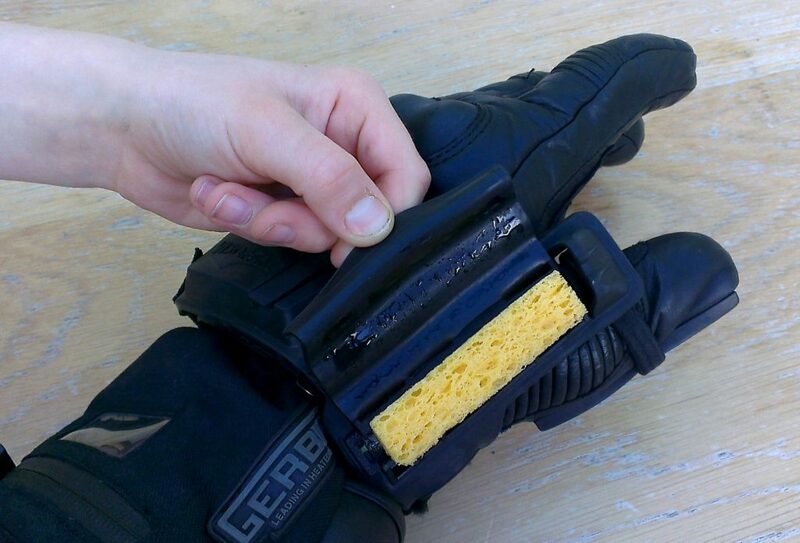 The sponge itself can also be slotted out for cleaning or replacement too. Overall, despite the aforementioned misgivings, I’ll still be taking this on a longer ride or tour. With more use, getting the hang of a clean wipe of the visor whilst on the move is definitely easier. Even just taking a moment longer at a red light stop to sponge and wipe your visor down and get clear vision again is great. It’s still way less faff than having to pull over and dig stuff out from under seat. When commuting round town your visor doesn’t get so bad (except on wet winter days) making the Visorcat less essential, but still handy nonetheless. Is it worth the £35? Compared to the frustration of not being able to see properly where you’re going and having to keep stopping and using other visor cleaning stuff – I believe so. Find out more and buy the Visorcat direct at www.visorcat.com.